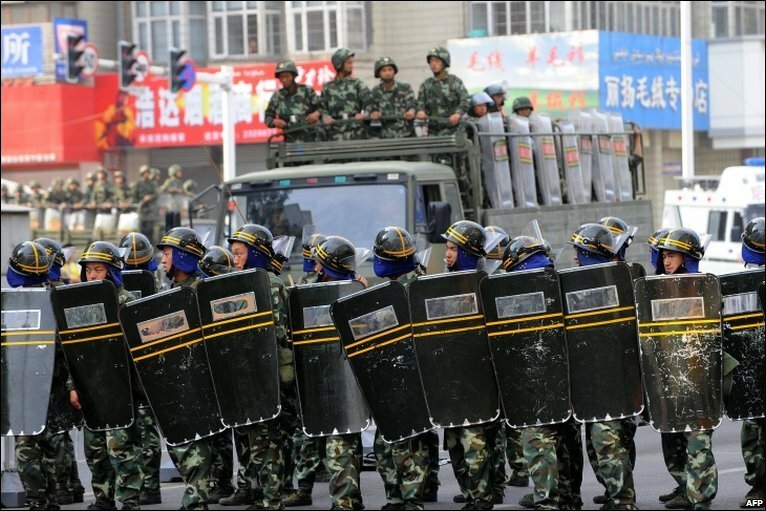 Though there is a long history of protest in Xinjiang (most notably in Baren, in 1990, and Yining, in 1997) the recent unrest in Urumqi differs from previous clashes in two important respects. The first is that however the events of July 5th started (whether it was intended as a peaceful protest or not), it definitely ended in violence. Usually this violence has been between Uighur protesters and the army or police (with the protesters on the receiving end). On this occasion, judging by scores of interviews (and the casualty figures, of whom two-thirds were Han) the violence was mostly aimed at Han residents. This, then, is violence on purely ethnic grounds, aimed at other citizens rather than representatives of the government. The second is the Han response to Sunday’s riots, when they purposefully set out to attack Uighur neighborhoods.This has reinforced the purely ethnic side of the conflict. The role of the police, unusually, has thus been to actually keep the peace. Whilst the authorities represent a clearly defined entity, about which specific (and verifiable) grievances can be expressed, the same logic cannot apply to other ethnic groups. The fact that most of the police and army (and government) are Han Chinese naturally leads people to conflate the two, but does not, I think, necessitate an automatic hatred for people as individuals. When I lived in Yining in 2001-2, Han and Uighurs were able to co-exist, albeit often in separation (separate schools, neighborhoods, shops and restaurants). Though there was prejudice in abundance, there was rarely any sense that it would escalate to violence. But even uneasy co-existence seems far off in Urumqi. There will probably be soldiers on the streets for a long time.